an awareness that future Provincial administrations will inevitably have fewer members with extensive and/or recent direct involvement with, and knowledge of, the three colleges. The intention is the Senate will both relieve the Provincial of a significant workload in providing practical and oversight level support of the colleges and also give Boards of Proprietors continuity in who they were dealing with. Front left to front right: Brian Cummings (Chair), Brian McGuinness, Tim Gordon and Geoff Bailey. 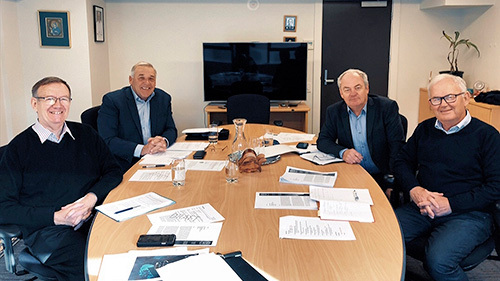 The members of the SMNZ Colleges’ Senate have a strong involvement in Marist education, including being former students, current and former parents of students, former teachers, business, property, construction and financial services. Normally on the mornings of the last Monday of each month, at Cerdon, the Marist Provincial offices on Thorndon Quay. Twice a year these meetings are extended to all–day meetings to include time with the Chairs of the three Boards of Proprietors. To act as the agent of the Provincial as regards St Patrick’s College Wellington, St Patrick’s College Silverstream and St Bede’s College Christchurch. To ensure the three colleges remain recognisably Marist in both their spirit and their functioning. To nominate to the Provincial new members of the Boards of Proprietors. To keep the Provincial informed as to what is happening at the colleges and be able to assure him that all compliance requirements are being met. To provide to Board Chairs the Provincial’s “viewpoint” on issues, as appropriate. To provide formation in the Marist charism to Boards of Proprietors and to Board of Proprietor Appointees on Boards of Trustees. To provide support and direction to Boards of Proprietors. To foster and encourage the sense that the three colleges are not simply separate entities but together are a group within the Province and so look for ways in which they can cooperate and work together. To provide – in consultation with the Provincial and his Council – forward planning for the future of the colleges, both individually and collectively. The primary areas of interaction for the Senate are with the Provincial and his Council (usually through Tim Duckworth) and with the Chairs of the Boards of Proprietor. In the course of each year the Senate spends a day at each of the three colleges. In the course of that visit, the Senate holds its monthly meeting; gets to view the physical plant of each college and be appraised of property plans and needs; meets with the Rector and Senior Management; meets with some students; has time with the Board of Proprietor Chair and attends the monthly Board of Proprietors meeting.